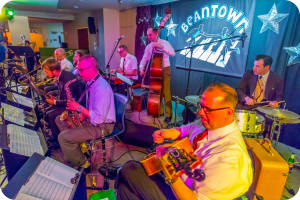 The Rhythm Serenaders are an aggressively faithful presentation of tightly-arranged, riff-dominated swinging small-group created for a swing dancing public. Careful transcriptions and subtle adaptations of Goodman/Christian Sextet dominate the repertoire, with thoughtful forays into the combo work of Ellington, Basie, as well as some of the later 40’s material put down by Eldridge, especially his time with Artie Shaw. Bandleader Michael Gamble’s 15+ years in the international swing scene inform every aspect of the band’s repertoire and taste.